North of Grotto and Chain Lakes Groups a bridge over Firehole River leads into the Morning Glory Group. 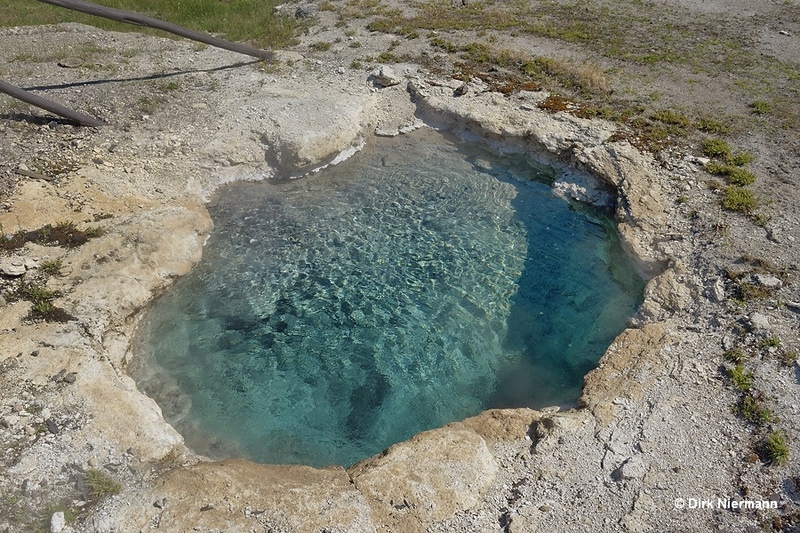 Several important geysers are among the features gathering around the famous Morning Glory Pool. Above all to mention are Mortar Geyser and Fan Geyser, located directly beyond the bridge on the riverbank. They are connected subterranean and erupt almost always in concert. 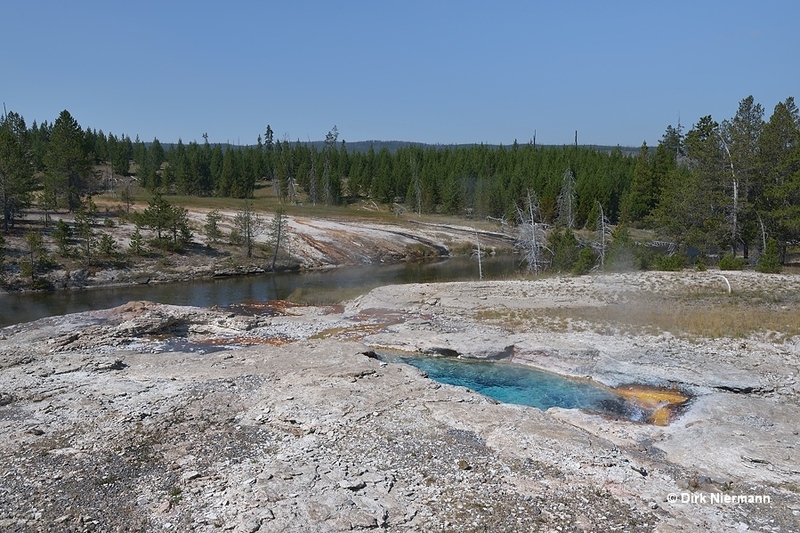 Both geysers encompass several vents, which are carrying names of their own. 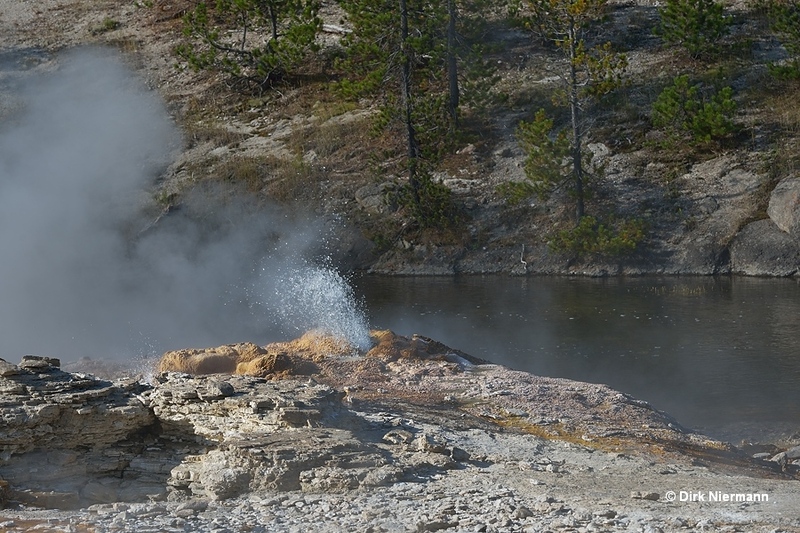 Fan and Mortar are cyclic geysers with a complex pattern of activity. Intervals reach from days to some weeks. 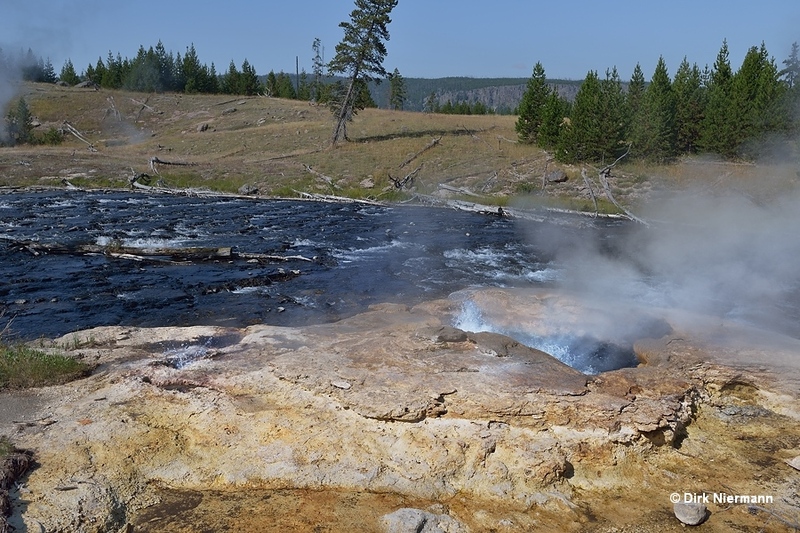 Fan Geyser sends angled jets up to 38 m (125 feet) high, Mortar plays up to 15 m (50 feet). 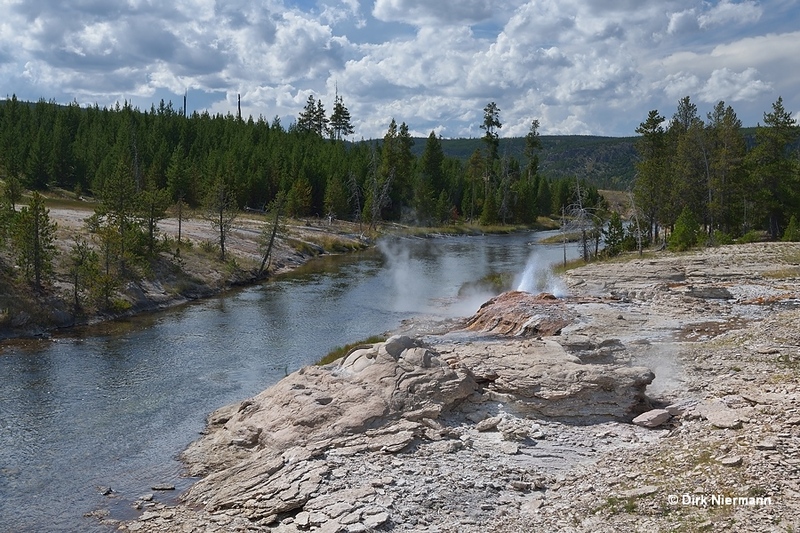 From the bridge you may also spot the perpetually spouting West Sentinel Geyser 200 m downstream at the river bend. 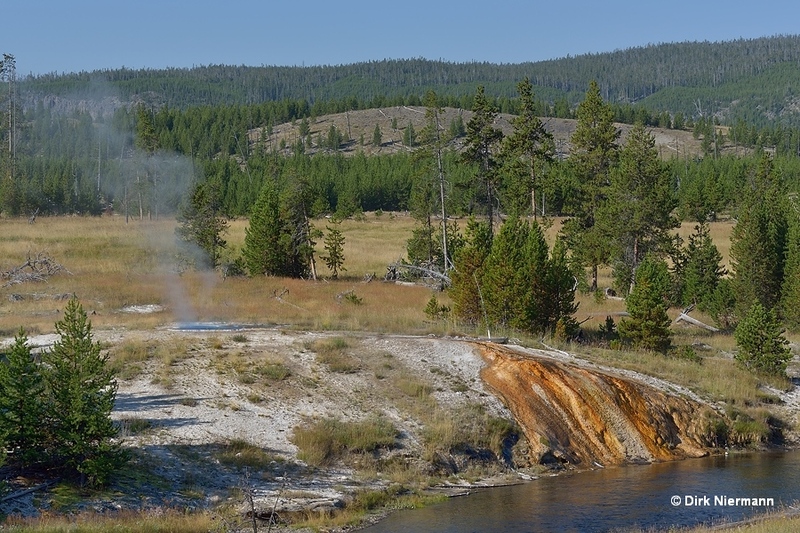 Spiteful Geyser lies north of Fan Geyser next to the trail. 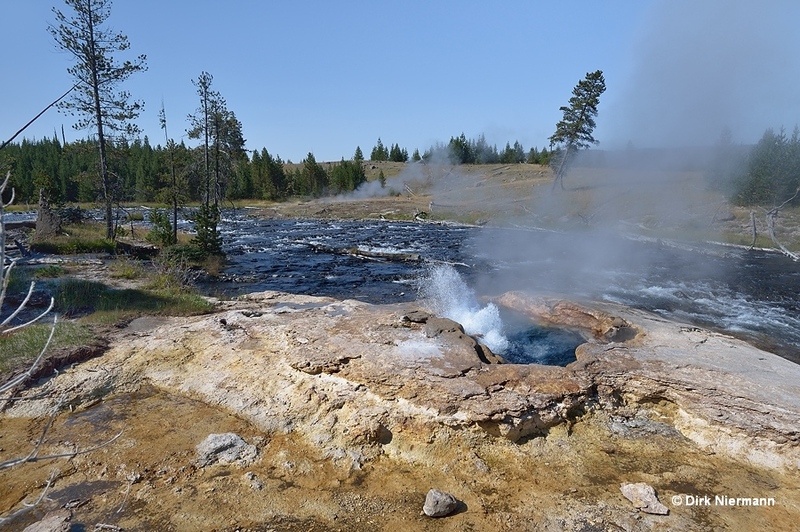 It is an irregularly and very rarely erupting geyser, whose bursts may reach 9 m (30 feet) height. Across the trail from Spiteful Geyser the fenced off Norris Pool can be seen. Eruptions of considerable height occurred around the turn of the millenium. 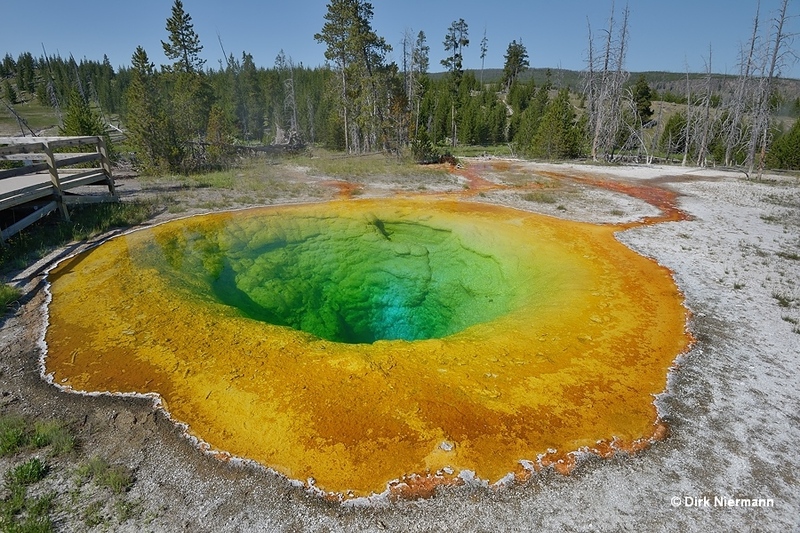 The famous Morning Glory Pool is still a gorgeous sight, but far away from its pristine state. Objects, thrown into the pool by visitors, have almost clogged its vent and block the supply of hot water from the depth. As a result the brilliant blue color of the bowl has shifted to green and the once narrow yellow ring around the rim has broadened considerably. Several attempts of the National Park Service to re-enlarge the vent failed. North of Morning Glory Pool the trail continues in direction of the Cascade Group. 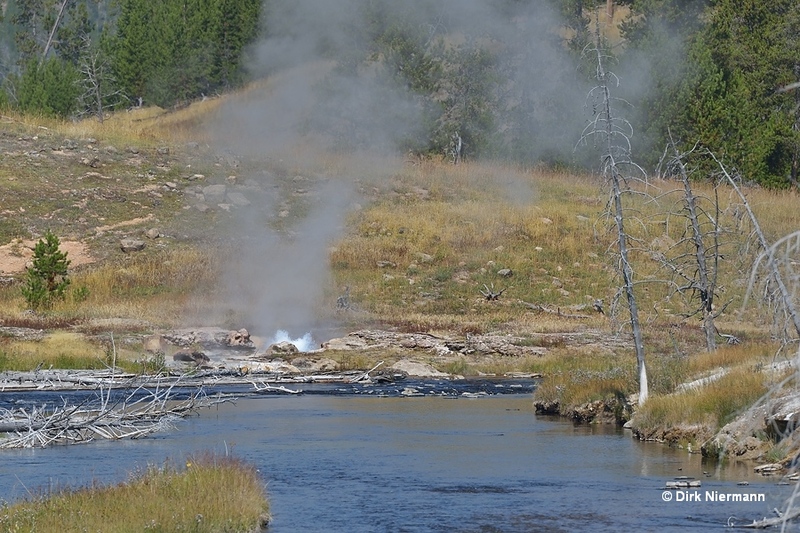 After 100 m (330 feet) there is a branch-off to Firehole River, where you meet with Sentinel Geyser. Sentinel's bowl comprises two vents. The one on the southwest side is capable of erupting up to 6 m (20 feet), the one in the northeast up to 12 m (40 feet). However, eruptions are generally rare, and in particular ones of that size. On Sentinel's sinter mound, a few feet south of its bowl, some small holes, called "Sentinel's Vents" are to be found. They frequently show splashing up to 1 m (3 feet). Farther north the trail passes Green Star Spring beyond the river.